A simple yet tasty salad which I served with chicken strips and cauliflower steaks the first evening. I had enough left-over for the following day so I sprinkled a tablespoon of my frozen lemon granules over it, and WOW did it bring out the flavour. This I served up with some slices of my homemade meatloaf. 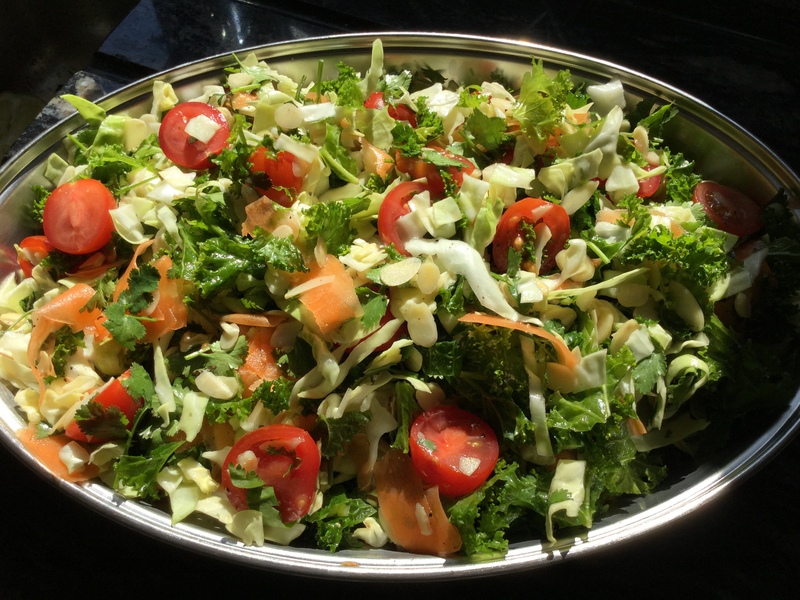 A salad which could accompany so many different dishes, or be enjoyed on its own. Remove any stalks from the kale and tear it into bite-sized pieces and place in a large bowl. Pour over a generous lug of olive oil and massage the kale with your hands for two to five minutes. This softens the leaves and turns them bright green and makes them sweeter. Using a potato peeler or very sharp knife, peel very thin slices from the carrot. Chop the coriander or parsley roughly. Gently mix all the above together and season well. Stir in the flaked almonds. Pour over lemon juice and more olive oil if wished and mix to ensure everything is coated. This entry was posted in Salads and tagged Almond, cabbage, Carrots, Gluten Free, Healthy Eating, Kale, Lunch, Salad, Tomatoes, Vegetarian. Bookmark the permalink.